Formula One: Lewis leads Silver Arrow 1-2 in scintillating desert race! 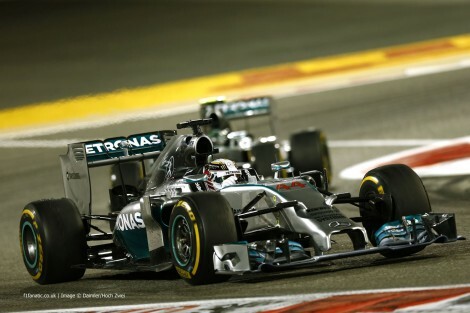 Home » Formula One: Lewis leads Silver Arrow 1-2 in scintillating desert race! 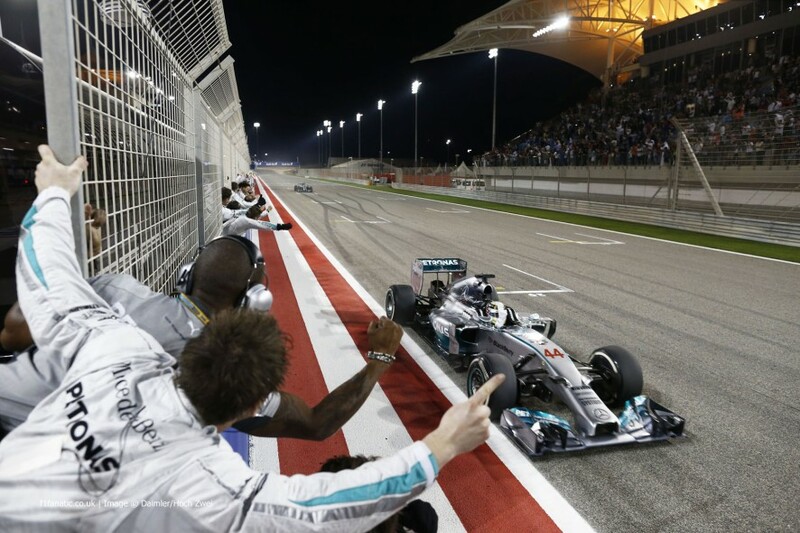 Lewis Hamilton has won the 2014 Bahrain Grand Prix in a breathtaking finish to the 900th Formula One race in history. A late safety car bunched up the field, leading to a 10 lap sprint to the finish between Hamilton and team-mate Nico Rosberg. 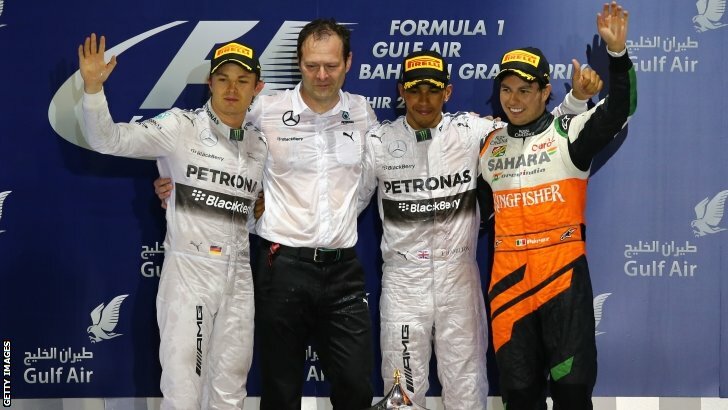 Rosberg tried as hard as he could but could not get passed the sister Silver Arrow but had to settle for second ahead of Sergio Perez; who secured Force India’s first podium since the 2009 Belgian Grand Prix. It was Nico Rosberg who stole the pole position from Lewis Hamilton in yesterday’s qualifying session, but it was Lewis who stole the lead into turn 1 after getting a better start than his team-mate. Nico edged Lewis to the inside of the circuit, but Lewis didn’t falter and broke later to take the lead. Nico tried to get the lead back around the outside of Lewis at turn 4, but was edged out wide by the leader. Felipe Massa was perhaps the man with the best start of all as he vaulted from 5th to 3rd, a position previously held by team-mate Bottas as the Finn fell back after an awful start. Former Ferrari team-mate Alonso tried to follow Felipe up through the order, but still remained in the latter half of the top 10. Nico Hulkenburg soon started pressurizing the Spaniard and managed to pass him into turn 1; with Alonso complaining that he had no power compared to his rivals. Bottas was continuing to fall down the order in the Williams car. Jenson Button threw his McLaren up the inside of the Finn at turn 1, with Hulkenburg following the McLaren through. The battles continued throughout the field, with Daniel Ricciardo pulling off a textbook ‘undercut’ move on Kevin Magnussen. Ricciardo then continued to make progress and soon found himself on the back of team-mate Sebastian Vettel! Sebastian’s Red Bull had lost rear tyre grip and DRS usage, which meant that the German soon started to hold Ricciardo up. He left it down to his team to decide whether to ask Sebastian to move out of the way, which they did. Sebastian obeyed the order and then asked to pit for new tyres. Sergio Perez followed the world champion into the pits on the next lap for Force India, with the first phase of stops well underway. Felipe Massa’s stop hadn’t gone to plan and as a result, he was behind his team-mate who had set fastest laps on his new rubber. Lewis Hamilton was starting to struggle with tyre wear at the front, which left him open to attack from his team-mate. Rosberg threw his Mercedes up the inside into turn 1, with Lewis grabbing the cutback; narrowly missing the front wheel of his team-mate. Rosberg was undeterred and tried again on the next lap, pulling off the move and taking the lead on the run to turn 4. It wasn’t over yet however, as Hamilton slip-streamed down the straight to re-take the inside line and the first position at turn 4. Mercifully, the heart in mouth action ended, for the moment, when Hamilton entered the pits on lap 20, followed by his team-mate 2 laps later. The team decided to split the strategy, with Hamilton on the faster, soft tyre, and Rosberg on the longer lasting hard compound. Rosberg re-joined a few seconds behind his team-mate and settled in for a long stint before his second and final stop. The two Force India’s of Hulkenburg and Perez were closing in on the Williams pair in 3rd and 4th. Bottas was starting to hold Massa up, with Bottas losing tyre group by the moment. Valtteri peeled into the pits for new rubber, but it was too late for Felipe to get away. Hulkenburg tried to slipstream his way past Felipe, but left himself open to a move by team-mate Perez. He blasted his way through into 4th and then pulled off a fantastic move at turn 5 to retake the podium position. Hulkenburg then followed the Mexican through, with Felipe pitting a few laps later. Perez took to the pits along with a few others for the final time on lap 35, with Sergio emerging back on track to pass the Ferrari of Alonso with ease. The Scuderia cars had been down on power all weekend which left them defenseless on the straights. 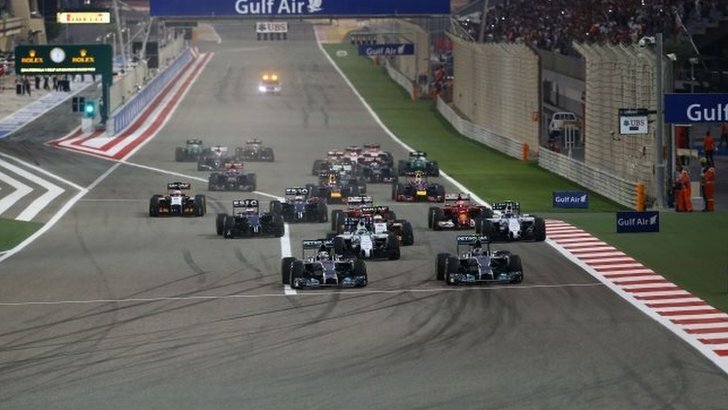 The two Mercedes cars were long gone at the front of the field, with Hamilton leading by 7 seconds over Rosberg. The final stint promised to be exciting as Rosberg would switch onto the faster tyre, with Hamilton moving to the slower hard compound. This meant that Rosberg would be hunting Hamilton down in the final few laps. This hunt suddenly became much easier, with Hamilton’s lead suddenly disappearing when the Safety Car emerged on track. The culprits? Pastor Maldonado and Esteban Gutierrez. Maldonado was exiting the pits when he smacked into the back of Gutierrez’s Sauber. The contact sent Esteban tumbling through the air and into a roll, with the car landing heavy on it’s wheels. Esteban climbed out of the car and went to the hospital for a check-up after the race. 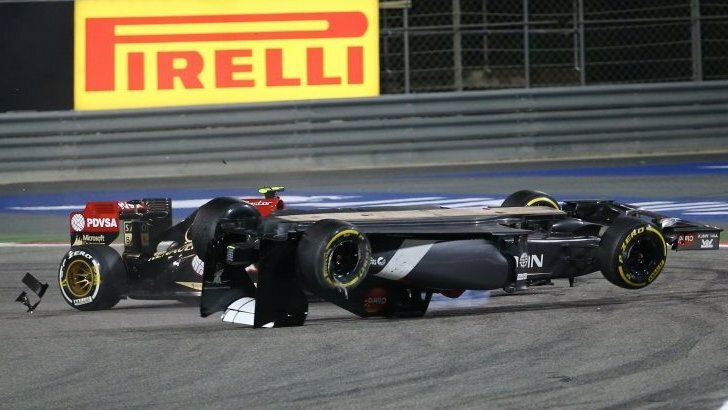 The accident led to Maldonado receiving a 10 second stop-and-go penalty, a five place grid penalty for the Chinese Grand Prix and 3 points on his license. Both Hamilton and Rosberg pitted at the earliest opportunity, with the pair just managing to get new tyres on the same lap. Hamilton took the slower, longer lasting hard tyres, with Rosberg moving onto the faster rubber. With Rosberg restarting right on Hamilton’s gearbox, it would be a 10 lap sprint to the flag between the two Mercedes cars. The team’s technical director Paddy Lowe radioed both of the drivers, reminding them that there were only a few laps left and to try and bring both cars to the finish. Anyone who thought that this was an order for the cars to maintain position were soon proven wrong. It was just one lap before the Silver Arrows were side-by-side once more, with Hamilton firmly shutting the door on Rosberg. There was a brief scare for Hamilton when he reported that he had no power, but he defied any notion of an impending retirement by setting the fastest lap of the race. A small gap grew between the cars, which Nico soon brought down as he launched another assault into turn 1 with 6 laps remaining. The pair remained side-by-side for the new few corners, with another attempt at an outside pass on Hamilton into turn 4. Lewis shut the door once again and kept the position. Rosberg had another go on the next lap, with another bold out-breaking maneuver into turn 1. The German went in too deep, with Hamilton simply breaking earlier to get the cut back to hold the lead once more. It looked as though the alternate strategy was swinging in Hamilton’s favor, with Nico starting to lose grip on his soft tyres. Lewis however, had plenty of grip left in his Mercedes as he pulled out a lead of around a second over his team-mate. With Nico falling back, Lewis was able to catch his breath in the final few laps and on lap 57 he crossed the line to take the victory in the 2014 Bahrain Grand Prix. Hamilton’s 24th Grand Prix win saw him equal Juan Manuel Fangio’s record of wins. Fireworks lit up the night sky to bring the drivers home, with Rosberg completing a second Mercedes 1-2 in a row, the first time Mercedes have done so in history. Force India managed to score their 2nd ever podium finish with Sergio Perez coming home in a hard-fought 3rd place, his 4th podium finish of his career and the first podium for the team since the 2009 Belgian Grand Prix; when Giancarlo Fisichella almost grabbed victory at Spa Francorchamps. Daniel Ricciardo finally managed to score and keep his first points for Red Bull after a late charge through the field. He managed to pull off a great move up the inside of team-mate Vettel and many others to come home just off of the podium in 4th. Nico Hulkenburg completed a strong finish for Force India in 5th, with the team moving up to an incredible second in the teams championship. Vettel was losing pace throughout the race but managed to hold on to take a well deserved 6th place at the wheel of his RB10. Felipe Massa was the next driver home in 6th place ahead of team-mate Bottas, replicating the finish that the Williams duo scored a week ago in the Malaysian Grand Prix. The two Ferrari’s completed the points paying positions, with Alonso seeming ecstatic that he had scored 2 points. He punched the air in a speculated sarcastic manner when he crossed the line ahead of team-mate Kimi Raikkonen. Daniil Kvyat failed to continue his run of points finishes in his first season as he finished just outside the top 10. Romain Grosjean was just behind the Russian in 12th, with Max Chilton finishing on the lead lap for Marussia. Pastor Maldonado was the last man to be a lap down on the leaders after his stop and go penalty for demolishing Gutierrez at turn 1. He was ahead of Kobayashi and Bianchi who were the last of the drivers running at the end of the race. Jenson Button’s 250th Grand Prix was far from a fairytale finish, with the McLaren driver having to retire to the garage in the closing stages. The miserable day for McLaren continued with Magnussen retiring during the safety car with a suspected clutch failure. Marcus Ericsson also befell mechanical issues and is yet to have finished a Grand Prix. Jean-Eric Vergne, who it emerges was hospitalized after the opening Grand Prix due to issues regarding his weight loss (in order to comply to the FIA weight limit this season), retired from the race in his Toro Rosso, with Adrian Sutil being the last classified finisher after retiring early on in the Sauber.